By the 1960s, Graham seems to have retired his “Casey at the Bat” sermon. Yet his take on Thayer’s poem nevertheless fits with two themes that remained consistent throughout Graham’s long ministry: his focus on a moment of spiritual decision, and his interest in sports. Indeed, Graham’s ministry provides a useful lens into a long-forgotten transformation in the way that American evangelicals related to sports. In the decades to follow, scores of famous athletes would share Graham’s stage. But in the 1930s there was still a measure of ambivalence about sports in Graham’s religious circles. Fred Brown, for example, had played football while attending the fundamentalist Bob Jones College. But by the time he met Graham, his alma mater had dropped the sport because, as one college leader put it, the games attracted “a bunch of wild people who will come and drink and curse and litter your campus with whiskey bottles.” Here, then, was the dilemma Graham faced as he enrolled in college in 1936 and began his own career as a fundamentalist evangelist: he loved sports, yet he was entering a world that was wary of the worldliness often associated with sports. Not all fundamentalists took Bob Jones’ hard-line approach to football. Wheaton College, at which Graham enrolled in 1940, was proud of its small-college football program, and numerous fundamentalist evangelists in the interwar years—Paul Rader, Charles Fuller, and “Fightin” Bob Shuler, among others—played up their past involvement in the gridiron game, using it to project an image of vigorous masculinity (early twentieth century revivalist Billy Sunday had done the same with baseball). Yet, fundamentalists also maintained a commitment to prioritizing their spiritual lives over their athletic lives. Football and baseball were fine activities for youth and they could be used to make one’s evangelistic message more appealing. But the true heroes of the fundamentalist faith were not current athletes, but ex-athletes who sacrificed potential athletic fame to preach the gospel and provide a Christian witness. The model in this regard was William Borden of Yale (1887-1913). Borden participated in athletics in high school and college but left his comfortable life behind to become a missionary, dying in Egypt at age 25 before he ever had a chance to reach his intended mission field. Fundamentalists’ commitment to strict Sabbath observance, which included a ban on Sunday recreation (especially commercialized recreation), also loomed large in their view of acceptable sports participation. Although many American Protestants followed popular cultural trends in the 1920s by taking a more flexible approach to Sunday recreation, fundamentalists continued to insist on adhering to the Puritan Sabbath. College football was allowed and encouraged because its games were on Saturday. But professional team sports with Sunday games were not an option—at least not for “true” Christians. Popular evangelist Howard S. Williams put it succinctly in the 1920s when he discussed a professional football game scheduled on a Sunday in New Orleans. "There will not be a single Christian [in attendance]," Johnson declared. "Probably, however, hundreds of church members will be there." 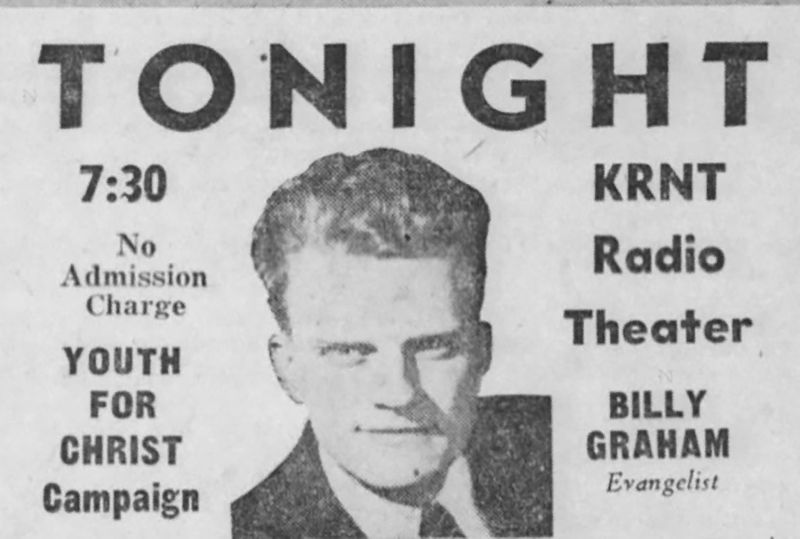 Strict Sabbath observance was still a priority for fundamentalists in the 1940s when Billy Graham joined the roster of the upstart Youth For Christ (YFC). Led by moderate fundamentalists who were re-making themselves into “new evangelicals,” the YFC blended modern communication and promotional tactics with an old-time emphasis on soul winning. YFC became a national phenomenon in 1944 as it preached its message of salvation to America’s youth in rallies that attracted thousands. Like Fred Brown and other ex-athlete fundamentalists from the 1930s, YFC evangelists often used sport to attract a crowd. But YFC went above and beyond its predecessors in intensity, even to the point of embellishing the athletic credentials of its speakers. 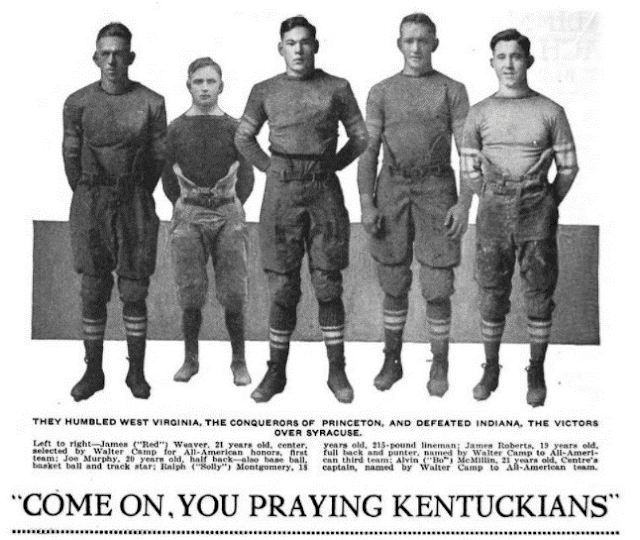 In YFC’s hands Billy Graham became a viable big-league prospect, while another YFC evangelist—Glen Wagner, a scrub lineman for Illinois in the 1920s—was presented as a former All-American football player. At the same time, however, YFC continued to reflect fundamentalist ambivalence about sport, remaining committed to Sabbath observance. The YFC roster generally included former athletes or current amateur athletes like miler Gil Dodds who refused to compete on Sundays. The lone professional athlete on the 1940s YFC roster, Dodgers pitcher Lee Pfund, played minor league baseball throughout most of the 1940s (with a brief stop in the majors in 1945), but had a clause in his contract that allowed him to avoid Sunday games. Graham continued to use sports as his ministry expanded beyond YFC. At an evangelistic campaign in 1947 he convinced fellow YFC alum Gil Dodds to offer a running exhibition and give his personal testimony. During Graham’s 1949 crusade in Los Angeles—the revival that put him on the national map—former U.S. Olympic runner Louis Zamperini (the main figure in Laura Hillenbrand's best-selling Unbroken) was converted and brought on stage the following night to provide his testimony. In early 1950, journeyman knuckleball pitcher Kirby Higbe—playing for the Giants at the time—was converted at a South Carolina crusade. 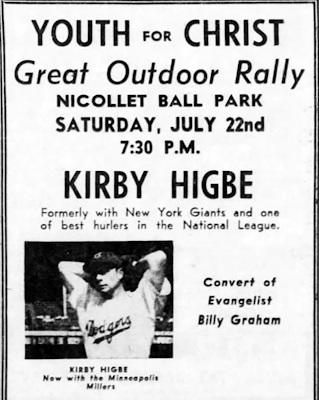 News reports promptly declared that Higbe had promised Graham he would win big-league players to Christ. "If it helps his pitching,” Higbe’s manager Leo Durocher stated in response, “I'll send for this Graham fellow immediately." With his crusades often held in sports venues, his use of athlete testimonials, and his penchant for sports references (like “Casey at the Bat”), Graham’s affinity for sport was readily apparent as he shot to national fame. Yet, even if Graham was especially conspicuous in his use of sport, in the 1950s he was limited in the type of athletes he could feature: professional athletes who competed on Sunday were still suspect to many neo-evangelicals. Kirby Higbe, who continued to pitch on Sunday after his conversion, was the exception rather than the rule. "If the Good Lord helps me with a year of winning games, I'll be able to tell the manager I don't want to pitch Sundays,” Higbe explained when asked about the issue in 1950. “If I don't have a good year, I'll have to take my turn as it comes." As it turned out, Higbe made only 18 appearances in the 1950 season before being sent down to the minor leagues. He never pitched in the majors again, and his religious zeal apparently waned as well. In Bums: An Oral History of the Brooklyn Dodgers, Giants teammate Spider Jorgensen recalled that Higbe's "Billy Graham period" was over by spring training in 1951 and the old rabble-rouser and womanizer nicknamed "Kirby F***ing Higbe" was back. Kirby Higbe aside, there was a clear neo-evangelical preference for athletes who refrained from Sunday sports. 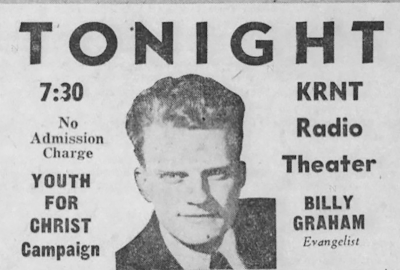 In 1953, for example, Graham used his newspaper column to answer a question about whether a Christian could play “big-time baseball or football.” Graham responded by encouraging Christians to participate in professional sports as long as they “maintained their testimony by consistent Christian living, by contagious Christian enthusiasm, by fair play and good sportsmanship, and keeping the Lord's day.” Only Sabbatarian Christian athletes like his old YFC pal Lee Pfund could fit that bill. Over the new few years Graham continued to urge Christians to stand strong when it came to the Sabbath. "The world needs today people with conviction enough in things Christian to refuse to conform to the popular trend,” he wrote in 1955. “People with sufficient regard for the highest things to say, 'Not today, thank you,' when asked on the Lord's Day to turn from work to play rather than from work to worship." Graham’s fellow neo-evangelicals echoed his commitment to the Sabbath. The “Eleven from Heaven” UCLA football team of 1954, so-named because the majority of the starting lineup was involved with Campus Crusade for Christ, included two star players—Donn Moomaw and Bob Davenport—who refused to play in the NFL after their college careers. For Moomaw and Davenport, playing football on Sunday was a sin that undermined their Christian witness. The 1958 book Ten Famous Christian Athletes, authored by a YFC leader, featured only athletes who refrained from Sunday play. And as late as 1960, an editorial in Christianity Today lambasted Christian athletes who played professional football and thereby "yielded to the lure of money and added fame, and joined in the desecration of the Lord's Day." In short, for the first two decades of Graham’s evangelistic career, fundamentalists and neo-evangelicals tended to view Sunday-playing professional athletes as nominal Christians at best, and not the type of people who should be presented as model Christians. The best neo-evangelical athlete was still the amateur or ex-athlete who could present an image of vigorous masculinity without violating the Fourth Commandment. By the 1960s, however, Graham’s views on Sunday sports had shifted. 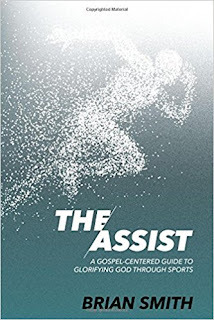 By then athletes like Bill Wade, Don Shinnick, and Bill Glass (football), and Bobby Richardson, Al Worthington, and Felipe Alou (baseball), had entered the professional ranks, playing on Sundays even as they expressed support for the born-again evangelistic message that Graham espoused. Graham’s insistence that athletes maintain their Christian testimony by refraining from Sunday play weakened, and he began featuring Glass, Richardson, and other well-known professional athletes and coaches at his revivals. evangelical athletes were popular subjects for evangelical book publishers. Like other aspects of Graham’s career, his newfound openness to Sunday-playing athletes was shaped by his pragmatic sensibilities. He was personally committed to strict Sabbath observance, but he did not want to detract from his evangelistic message by making the Lord’s Day a divisive issue. Still, Graham’s shift on the matter was not easy. In 1957, for example, when asked to provide evidence that conversions from his crusades were permanent, he cited the example of Emory Harper, a professional golfer from South Carolina. Harper, Graham stated, was “a Godless man when I first met him” but after coming to Graham’s meetings and being converted to Christianity he became a “shining example of Christian manhood” who demonstrated his faith by refusing to golf in a championship match on Sunday. Yet, other statements from Graham in 1957 revealed his recognition that strict Sabbath observance was a lost cause in American society. He increasingly shifted his discussion of the Lord’s Day to a focus on the therapeutic benefits of Sabbath observance rather than on the need for a “Christian witness” defined by abstaining from work and recreation. To this he added a willingness to allow for differences of individual conscience on the matter. "We must not submit to a legalistic Christianity that is encumbered with commands and prohibitions," he stated in response to question about operating a business on Sunday. "Our first and greatest commandment is to love God and to love our neighbor as ourselves. Therefore, you must make the final decision in this matter." Graham’s evolution did not come without criticism. In 1965 a concerned minister took issue with Graham’s willingness to let Bobby Richardson and Bill Glass share their testimony when they were “Sunday after Sunday, deliberately violating the Fourth Commandment and, also, turning a deaf ear to God’s earnest plea not to do so." But although Graham personally sympathized with this concern, strict Sabbath observance was no longer an issue Graham was willing to emphasize. For the rest of his career, Sunday-playing athletes and coaches were a prominent feature at many crusades. By 1974, when Graham penned a Reader’s Digest article titled “What ever happened to the old-fashioned Sabbath?”, he could only look back with nostalgia at the way things used to be, seeking to recover "some of the timeless values of Sabbath-keeping" while accepting that times had changed. The popularity among evangelicals of the 1981 film Chariots of Fire—which highlighted the story of 1920s Scottish runner Eric Liddell—reflected a similar sensibility. Liddell’s willingness to sacrifice an Olympic medal because of his Sabbatarian convictions was inspiring—not in the sense that evangelicals clamored to embrace Liddell’s Sabbatarian commitments, but rather in the sense that it represented a general principle of conviction that evangelicals could apply in other ways in their lives. William Borden and Lee Pfund were out. Bobby Richardson and Bill Glass were in. No longer did evangelical athletes need to sacrifice athletic fame and glory to prove their Christian witness. So long as they were willing to take the stage and share their faith, athletic fame and glory was witness enough. And although Graham did not lead the way in this—he was following popular trends, and then only reluctantly—he nevertheless helped ease evangelicals’ transition into their new Sunday-sports world. When Billy Graham passed away last month, a few commentators took notice of his penchant for sports. Some mentioned his use of athlete testimonials, others his sports connections in North Carolina. Some noted, too, that prominent Christian sports figures like Tim Tebow had eulogized him on Twitter; one even claimed that Tebow would soon take Graham’s crown as the most influential Christian leader in America. So drastic has been the shift in evangelical views of Sunday sport that it seems almost ridiculous to consider this irony: when Billy Graham was delivering his “Casey at the Bat” sermons seventy years ago, Tebow’s blatant violation of the Fourth Commandment—in not one, but two sports!—would have been a likely sign that he needed to repent before strike three came hurtling towards him.